When a restaurant has been open for more than 120 years and has been awarded #1 in New Orleans for the past 18 consecutive years, it's kind of a big deal. However, not only is this restaurant very famous worldwide, but it also offers very tasteful dishes as well. Chef Tory McPhail and his team have created a menu inspired by Creole and Louisiana cuisine. In fact, even though all dishes seem to be aligned with modern style cooking, they are still based on traditional recipes. Interestingly, the Chef has a "dirt to plate within 100 miles" policy, meaning that 90% of their ingredients used come from within 100 miles of the restaurant's location. As you may have realized by now, Commander's Palace is not your average everyday restaurant, but in my opinion is definitely one you should experience. So if you're already thinking of making a reservation, you should definitely be aware of their dressing code. Guys, you better wear those blazers you own, and girls it's time for that cute black dress you like to wear. But, if you're more kind of a jeans person, then you need to reconsider wearing them, as they're "discouraged" in the restaurant. The interiors of the restaurant are focused on big chandeliers, white cloth dining tables and leather chairs, while a few decorative mirrors hang on the walls. The service is almost outstanding, and there is also a dedicated server for each table making sure there is no request that doesn't get satisfied immediately. 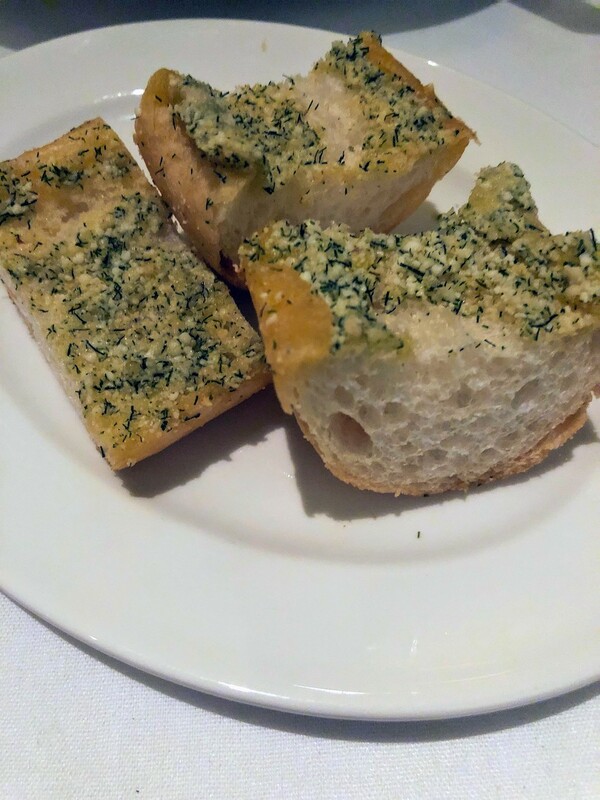 Within minutes of sitting down on your table, a server will come offering you some warm buttery garlic bread. Do not say not to that! This garlic bread probably tastes better than any other you've had before. Oh btw you can ask for a refill. Looking at the appetizers, their Carbonara, may not be exactly a replica of the Italian dish, but it is absolutely delicious. Speaking of delicious though, if you're a foie gras lover, then you definitely need to get that appetizer. It is served with some caramelized apple and two donut-style fried doughs topped with sugar and cinnamon, that make the perfect combination. As for their salads, the Commander's Crisp Romaine Salad is very fresh. The main course I would recommend is the Filet Mignon of Black Angus Beef, served with buttery Creole smashed potatoes and mushrooms. Wow! They really know how to make and serve a juicy tasty filet. Lastly, do not forget to make some room for dessert and try out their Creole Bread Pudding Souffle. It is perfectly baked, crunchy on top and moist on the inside.